FairPay, my radically new spin on Pay What You Want pricing (PWYW), may be especially timely for the music business and the video game business. It offers a way to encourage fair levels of pricing while giving buyers a high degree of freedom to set their own price. The music business has been turned upside down by the challenges of Internet distribution and related piracy, to the point that the prominent band Radiohead offered its 2007 album for download on a PWYW basis. While a reported 60% downloaders did not pay at all, enough did (paying an average of $8.05 in the US and $4.64 elsewhere), to make that experiment modestly successful, and led to other similar offers by other groups. Downloadable games have also been offered on a PWYW basis, with similar modest success. As described elsewhere on this blog, and on the Web, my new variation, FairPay (short for Fair Pay What You Want), uses Internet feedback on what buyers pay, in order to develop a reputation for fairness, that gives a strong incentive to pay fairly. 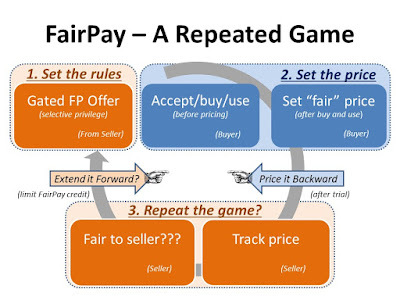 A key part of this method is that the seller (or multiple sellers) use this FairPay reputation feedback to decide whether to extend further offers to a user based on how fairly he pays. 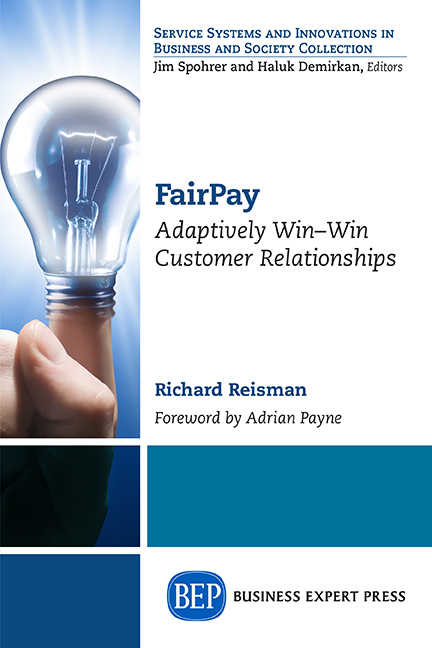 FairPay does not just rely on innate buyer fairness, but looks over their shoulder to help give that sense of fairness powerful weight. This creates a dynamically adaptive cycle of offers, prices, feedback, and further offers that rewards those who pay fairly and cuts off those who do not. The method works best for an ongoing series of offers and sales. That may not be very effective for a single music group or game developer who can make only infrequent offers of new products, but can be very effective for a music label or game distributor who has an ongoing library of products to offer for sale. I suggest that labels and distributors seeking better revenue models should try this, and offer to assist in such an effort. I also suggest that individual artists or game developers who prefer not to work with a conventional label or distributer might seek to band together to create a shared distribution co-operative to achieve the modest critical mass of products needed to enable an effective FairPay feedback process. The FairPay process for such a business can be quite simple. A distributor of music or games offers to let buyers try a few items on an enhanced PWYW basis, with the understanding that the buyer can try the item for a time, see if they like it, and then set whatever price they consider fair (post-sale PWYW). 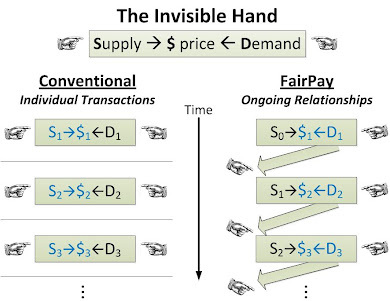 The full FairPay process would be explained in detail up front, so buyers understand that future offers will depend on what reputation they develop for paying fairly. The seller then assesses the price paid, and the reasons, and decides whether to offer that buyer more items on the same basis. Obviously those who pay well will get a continuing stream of further offers (as long as they continue to pay reasonably well). Those who pay well for some, and explain why not for others, might also get a few further offers, effectively on a probationary basis, until it is determined by the seller that they either do or do not pay fairly. Those judged by the seller to generally not pay at an acceptable level can be cut off from further FairPay offers, and restricted to conventional, set-price prepaid sales (at least for some time, possibly extending another chance sometime in the future). The cycle continues, based on these FairPay reputations. Unlike most conventional PWYW offers that are restricted to short-lived special promotions, FairPay can be a long term proposition. Clearly buyers using this FairPay process will recognize that they cannot pay zero, or very little, and expect to get further FairPay offers (except for occasional cases of explainable dissatisfaction). Instead of a majority of buyers paying little or nothing, we can expect a majority paying a reasonable price. And the longer this process runs, the more meaningful the FairPay fairness reputations of the buyers, and the better able the seller is to manage revenue and risk, by controlling what offers are made to which buyers. This method might be especially attractive in situations where it is known that the artists or game developers get the dominant share of the revenue. Buyers will be especially motivated to pay at reasonable levels if they know that their payments are going to the artist or developer, rewarding them for a good product, and providing the compensation they need to enable them to continue to produce future products. This can work for studios as well, especially if they position themselves as being very supportive of their artists (or even owned by them, like the old United Artists). Of course FairPay is also applicable to large recording studios and music and game distributors as well. For example, iTunes or Amazon could easily make similar offers across their entire inventory of downloadable music, or across some subset. They might experiment with some selection of songs or albums. Perhaps they might start with less popular and familiar items that might especially benefit from the try-before-you-set-the-price features of FairPay, to increase sales (and revenue) even if the average unit prices are reduced. Similarly, subscription services like Rhapsody and Pandora could apply FairPay to their subscription offers (much like newspapers or video services, as described in other recent posts). Buyers will feel more respected and empowered by the added trust and flexibility. Some will pay less than the standard going rate, but some will pay more. Many who might not make a conventional purchase might be willing to pay something reasonable for a FairPay service -- added revenue to the seller. Sellers can individually and dynamically tune the details of the offers and the process to encourage good payment levels, and to send free-riders back into the hard pay wall of the conventional sale price.